Photographers: Learn the latest techniques for working with your images in Lightroom! 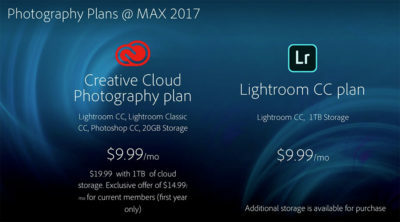 Announced 18th October on the Adobe blog and at the MAX conference in Las Vegas: Adobe has made major updates to the Lightroom family of products. These changes are likely to have significant impact on many photographers’ workflows. Firstly, the desktop application we’ve known as Lightroom up to this point is now called Lightroom Classic CC. Improvements have been made to performance and a few new features have been rolled out, such as Range Mask for local adjustments, but for the most part Classic remains the familiar tool we’ve used and loved all these years. Adobe has promised to continue their commitment to developing and supporting Classic. 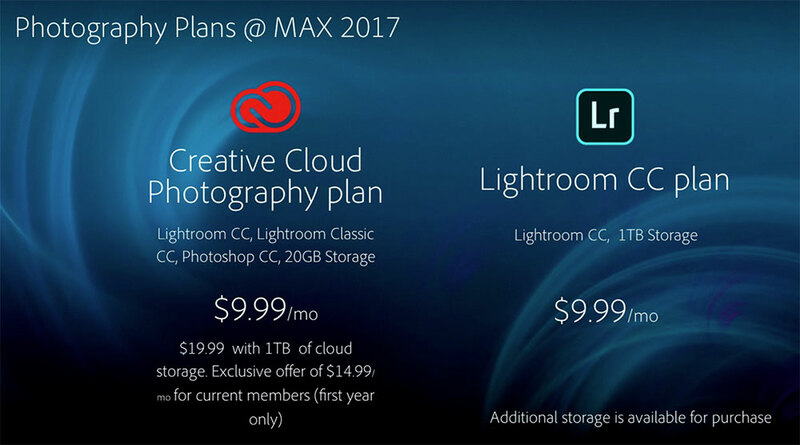 At the core of Lightroom CC is cloud storage. Your photos are uploaded (and backed up automatically) using Adobe’s servers. The apps run locally on your devices but there’s also a web interface that you can access via a browser. 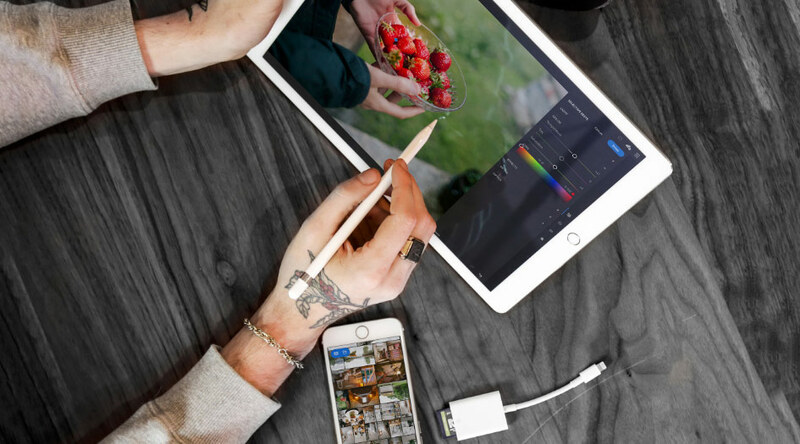 Because your photos are all stored in the Creative Cloud, you can access and edit them across a range of devices using consistent tools within the Lightroom CC family of apps. For the most part, reviewing and editing your photos is the same whether you’re using a desktop computer, tablet or smartphone, with a few notable exceptions (which are expected to improve over time). Most importantly, Adobe has committed to providing consistency between the tools available in all versions of Lightroom CC running on all platforms. What this all means is that it is now possible to securely store your photos in one location, access them from anywhere on many devices, and edit and share those photos—all using a consistent suite of software. I am teaching Lightroom at the Adobe Theatre all four days of The Photography Show, 18–21 March, NEC Birmingham. These sessions are free with your conference registration but will be ticketed. Tickets are free and may be collected in advance each day. Some tickets may still be available at the time of the session(s) but it’s best to get tickets ahead of time to ensure entry to a particular session. Note that these tickets for the Adobe Theatre are not the same as the ‘show tickets’ for the main conference. Tickets to the Adobe Theatre are only available at the stand, on the day. The Photography Show is the UK’s biggest and best event for all things photo related. My next class is 27th January at the National Space Centre in Leicester. I’ll be teaching essential skills for enhancing photos with Lightroom. Learn the most important adjustments in the Basic panel, dodging and burning with local adjustment brushes and gradients, retouching using the Spot Removal tool, and much much more! Correct exposure is certainly a Photography Essential! If your photos are actually underexposed, it may be your metering settings and/or technique that’s causing it, not the camera itself. Camera metering mode – matrix, evaluative, spot, etc. My friend and influential photographer Tony Sweet recently told me he’s making the switch to Adobe Lightroom (from Aperture) and asked for my Top Pro Tips. Here they are, in relative order of importance. 1. You can index your entire archive of photos in a single Lightroom catalog. I have well over 80K images in my master catalog and don’t have any problems with performance. I’ve heard reliable reports of people using catalogs containing many hundreds of thousands of photos. So there’s no need to split up your archives into multiple catalogs unless your workflow warrants it. (The exception is when traveling, see below.) I prefer to have every photo accessible in one place, whether it’s the original raw, converted DNG, layered TIF or PSD, etc. If I need to find a picture, I only need to look in my master Lightroom catalog. 2. Use a temporary, working catalog on your laptop when traveling. When you get home, copy the image files to your main hard drives and import the data from the trip catalog into your master catalog. This preserves all the metadata such as adjustments and keywords, as well as virtual copies and collections. 3. Always know what catalog you’re working in and where it’s located. You can find this information under Catalog Settings. A Lightroom catalog can be physically located on any drive, in any folder, and can use any name. There are several situations in which Lightroom might switch to the default catalog or create a new one. ***If you ever open Lightroom and things don’t look the way you expected, immediately confirm you’re working in the correct catalog! In Preferences, you can set the default catalog to open when Lightroom launches. On my system, I have an external drive containing a single, top-level parent folder called Nat Coalson Image Library, under which are second-level folders for each year – 2013, 2012, 2011 … etc. Within each year’s folder are the individual folders for shoots or trips. See the image to the right. 5. The folder and file structure on the hard disk is only the starting point. Using Lightroom Collections, you can (and should) organize your photos any way you want, for any purpose you might devise. For example, you can make Collections for your favorite selects from a trip; portfolios in development; book projects, client presentations, prints to make … whatever. This capability allows you to use a consistent, standardized structure for all your master image files on disk, while within the Lightroom catalog you have unlimited flexibility for using other organizational schemes. 7. When I make derivative files for uploading to my web site, posting on social media, sending by email, etc. I don’t keep these files in my catalog. For that matter, after I’ve uploaded a small JPG to a web site, for example, I almost always delete it from disk immediately. It’s rare that I re-use distribution files and I don’t want my hard drive (and Lightroom catalog) cluttered with myriad JPGs. As a result, every file in my Lightroom catalog is either a DNG or a layered TIF, with the rare exception of flattened, high-res print files that I keep with the originals in the catalog if I expect to re-use them. 8. Make extensive use of Presets, in all the modules and tools that offer them. Presets are one of Lightroom’s greatest strengths. Most importantly, create a Develop preset that contains the settings you want to use as the starting point for your files (you can make one for each camera). You can apply this default Develop preset during Import. You can also override the Lightroom Default settings, which are applied to images, as they are imported, when a Preset is not specified. 9. When you want to make different versions of a photo, use Virtual Copies. You don’t need to save multiple files on the hard drive! VCs exist only within the Lightroom catalog; they simply reference the original file on disk. You can make any adjustments you want to a VC and it acts like a regular photo in the catalog. Probably the most common example uses of VCs are making multiple versions with different crops and making both color and black-and-white versions of a single image. 10. Lastly, with regard to image adjustments, you’ll probably discover very quickly that there are several ways to achieve the same look using different settings. For this reason, in general, it’s good to take care to not apply one adjustment that counteracts another. The final processing results will be cleaner when you use only the minimal adjustments necessary to achieve the look you want. You may have noticed that most of these tips have to do with file management and organization–it’s because this is where most people get stuck. While these tips are most important for people just getting started with Lightroom, I hope this will also provide a good refresher for those photographers who’ve been using Lightroom for a while! As you may know, I’ve written three instructional books on Adobe Photoshop Lightroom (for versions 2, 3 and 4). They have been well received by the photo community and I’m very grateful for the support and positive feedback I’ve received about these books. For each edition, I’ve done my very best to provide clear, comprehensive instruction on how to use this most important photo software. Adobe recently released Lightroom 5 — an important update. Since then, I’ve received an incredible number of inquiries from photographers asking when (or if) my new book on Lightroom 5 will come out. When my publisher approached me earlier this year asking me to write the update to Streamlining Your Digital Photography Process, I had a lot of soul-searching to do. As an artist first and foremost, writing software manuals is honestly not my favorite thing to do. I wrote the three editions out of a desire to help other photographers and contribute to the promotion of Lightroom; I believe it’s the best software currently available for all kinds of photographers and I want people to know how to use it effectively. For the time being, I’ve decided not to continue writing printed Lightroom books. Rob Sylvan, a well known Lightroom expert and all around great guy, has picked up the torch for me. 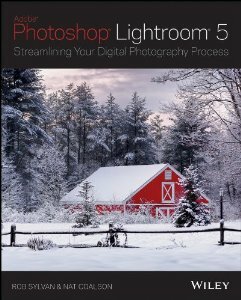 He wrote the new edition of Lightroom 5: Streamlining Your Digital Photography Process, incorporating much of my previous text from earlier editions. (All the new material on Lightroom 5 was written by Rob.) Rob was also the author of Lightroom for Dummies and runs the support desk for National Association of Photoshop Professionals; he’s an experienced trainer and writer and although I haven’t yet read his Lightroom 5 book, I expect it will be fantastic. Though I will continue to teach and write about Lightroom in various media and venues, I wanted my readers to know not to expect more printed Lightroom books from me, at least not in the near future. Please feel free to comment here or contact me directly if you have any questions or concerns. I look forward to continuing to support my students and colleagues throughout the photography industry in new, more innovative ways. Stay tuned to this blog and register to receive my newsletter for exciting announcements as they develop. As the saying goes, “onward and upward”! Importing photos is one of the most crucial steps for working with your photos in Lightroom. And for too many photographers it’s also one of the most confusing and frustrating aspects of using Lightroom. Whether you are new to Lightroom or are a more advanced user, mastering your Import workflows is essential. There’s lots more about Importing photos (and all other Lightroom topics) in my Lightroom 3 book. For the past several years I’ve used Adobe’s DNG file format to store the raw image data captured by my digital cameras. I convert my Canon CR2 raw files to DNG early in my workflow and don’t keep the original raw captures. I’ve had great success with a DNG workflow and since DNG files contains the original raw image data, I’ve seen no need to retain the native files. In every class and workshop I teach, the subject of DNG inevitably comes up. There’s a lot of confusion and uncertainty about DNG. So when researching subject matter for my next book, I thought I’d polish up my knowledge of this essential image file format. Adobe has just published an updated document on ways to maximize the performance of Lightroom, you can read it here. “I use, love and recommend Photoshelter highly. Get the Lightroom plugin for Photoshelter and you can export photos directly from Lightroom into your Photoshelter account. You don’t need PhotoZoom for resizing. The file size issue is not directly related to image resolution. A raw file does not contain pixels per se; its size is based on the amount of data it contains (though it does have a native resolution). When you convert a raw file to a tif, the resulting file size will be larger, even if the resolution remains unchanged. When you convert a raw file to a jpg, the file size goes down because a jpg file uses compression to eliminate redundant data and make a smaller file size. To say you need a 24mb JPG is off base. Regardless of the actual file size on disk, what matters are the dimensions (8×12) and the resolution (eg 300 ppi). With JPG, this might still only yield a file of 8-10 MB and that’s fine. With Lightroom, all you need to do when exporting is enter the dimensions and resolution you want and Lightroom does the rest. Again, you don’t need any other software for resizing photos. Note: stay tuned for the announcement of my new web site launch! Last week Monte Trumbull, renowned nature photographer and technical editor for my Lightroom books, emailed me a link to a new Lightroom plug-in for soft proofing. This is big news: I and many other photographers have wanted soft proofing in Lightroom for a long time. To my knowledge, this is the first soft proofing solution available for Lightroom. I’ve tested the plug-in extensively and my review follows. Now on to the plug-in. When I clicked the link Monte sent me, I was taken to http://www.lightroom-plugins.com/ProofIndex.php. To the right of the page are two prominent download links, one for a Windows installer and one for a Zip package with the plug in files for both Mac and Win. I also downloaded the manual. I used the Live Support link to contact the developer and I soon received a response from Jim Keir, a friendly chap who not only provided my license key but an installer for the newest version (which should be released by the time you read this). I decided to test the plug-in with Windows 7 first and later tested on OS X. I launched the Windows installer and in just a couple of steps had the plug-in installed. Couldn’t have been easier. On Mac, I simply put the SoftProof.lrplugin in Lightroom’s Modules folder. Next, in Lightroom under the File menu > Plug-In Manager, I chose the SoftProofing plug-in and entered my email address and key. The plug-in was already active; nothing more to do there. All told, the download, installation and registration process took less than five minutes. To use the plug-in you need to first select a photo in either the Library or the Filmstrip. (If you have multiple photos selected, the Active photo will be the one used for the soft proof.) You initiate the SoftProofing plug-in from the File menu > Plug-in Extras, so it’s available from anywhere in Lightroom. On Windows, you can use the keyboard shortcut Alt+F+S+S. The SoftProof window is clean, simple and easy to navigate. The middle of the window shows two previews: the original on the left and the soft proofed version on the right. Controls I started at the top right of the plug-in window, where there are dropdown menus to choose your monitor and printer profiles from a list of profiles installed on your system. (The Filter Profiles checkbox limits the profiles listed to only those appropriate for output; I leave this checked. To see all profiles on your system, including input profiles such as those for scanners, cameras etc. uncheck the box.) 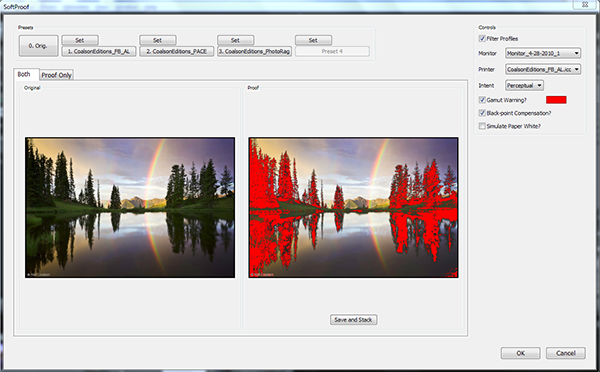 Choose different printer profiles to preview how the photo will look with the corresponding printer/paper combination. Below the profile selectors are options for Intent (Relative or Perceptual), Black Point Compensation (always leave this on), Simulate Paper White (which I always leave on) and Gamut Warning. Gamut Warning is disabled when Paper White is active; with Paper White turned off, you can enable Gamut Warning and you can set the color of the warning overlay by clicking the swatch to open the color picker. All these settings work the same as those in Lightroom’s Print module and are also identical to soft-proofing in Photoshop. After choosing your profiles and proofing options, the central preview display is automatically updated. You can also switch to a view showing just the soft proof. Along the top of the window is an area where you can save Presets for up to four paper profiles. The first, large button labeled O. Orig. simply resets the soft proof back to the original state, with no printer profile applied. To set the other four Presets, first choose the printer profile from the dropdown at the right side, then click the Set button to store that in the desired Preset position. After it’s set there, the button below changes to show the name of the profile and you can then quickly switch between soft proofs for your four saved profiles just by clicking the appropriate button. This button, located below the preview area, exports a copy file with the soft proof settings applied. The exported file is saved as a full resolution, highest quality JPG and appends the selected printer profile to the end of the file name. The new file is automatically stacked with the original. 1. Develop the master (original) file so that it looks exactly the way I want on my calibrated monitor. 2. Make a Virtual Copy (VC) of the finished master file. 3. Soft proof the VC using the plug in. 4. From the plug-in, do a Save and Stack. 5. Back in Library use Compare view to see the VC and the soft proof file. 6. Adjust the Soft Proof using Quick Develop so that it’s as close a match as possible to the VC. 7. Sync the Soft Proof settings to the VC. 8. Print the VC using the same settings that were used in the plug-in. Use Virtual Copies for printing. You can adjust VCs to make the best possible print for different conditions while preserving your finished master file in its original state. Never modify a master file for a specific kind of output. More about this is discussed in my article at the Lightroom Lab. When adjusting a print file based on a soft proof, the goal is to get the soft proofed version to match as closely as possible to the non-proofed original. This will provide the best possible color match for the print. One of the most useful features of the SoftProofing plug-in is that it allows you to see the difference between Perceptual and Relative intents. Some photos will look notably better with one or the other intent. Even if you only use the SoftProofing plug-in to see the difference in rendering intents before printing, your prints will start coming out much better. You can use the above workflows when preparing files for a lab. Get their custom profiles for the type of prints you’re ordering, go through the soft proofing and adjustment process for prints using virtual copies, then Export your print files (or use the Print module’s Print to File function). With the Save and Stack feature, I often had to switch between views and image sources several times for the stacked proof copy to be visible in the Grid and Filmstrip. In my testing the Save and Stack feature did not update Collections; the new JPG was only visible in the Folder view. After I clicked the 0. Orig. button, clicking the other presets or choosing different profiles did not update the proof preview; it just stayed on Original. This remained in both views. I had to cancel to get out of the plug-in and go back in again to see soft proofs. Adding Tooltips in the plug-in window would be a welcome improvement, especially for people new to the concept of soft proofing. The plug-in window interface could be better designed to make use of available space. All in all, these are minor nits for a v1 release and there was nothing in my experience that would keep me from recommending this plug-in. The Mac and Windows version function identically; both are super easy to use and work as advertised. The soft proofs I see with this plug-in are on par with any soft proofing I would do in Photoshop. One significant difference between using this plug-in and working in Photoshop is that you can’t make adjustments when looking at the soft proof. In Photoshop, you can look at your soft proof and use layers to adjust saturation, curves etc. and see the effects in real time. With this Lightroom plug-in, you can see a soft proof and render a reference file showing the proof conditions, but you need to do the adjustments outside the soft proof environment, which could result in numerous trips back into the plug-in to check results. All in all I don’t see this as a huge downside; just a new way of doing things. As the first of its kind, this plug-in is long overdue and is a “must-have” for photographers wanting to have the most possible control over their prints. Kudos to Jim for putting out a great product at a great price, and one that well serves a real need. Last night Adobe released the updates for Lightroom 3.3 and Camera Raw 6.3. If you have earlier versions already installed, you can update them using the internal update mechanism, or you can download them here. These releases add new lens profiles, raw support for new camera models and a number of perfromance improvements and bug fixes. The updates are recommended for all photographers using the software. Adobe has also released a new Lens Profile Downloader that allows you to install profiles for a wide range of SLR lenses. Lens profiles correct distortion, vignetting and chromatic aberration specifically for the lens used to make the capture. For more on lens profiles and to get the downloader visit Adobe Labs. For a full list of all the improvements offered in this upgrade click here. B&H Photo is offering a big discount on the full version of Lightroom 3… only two days left!